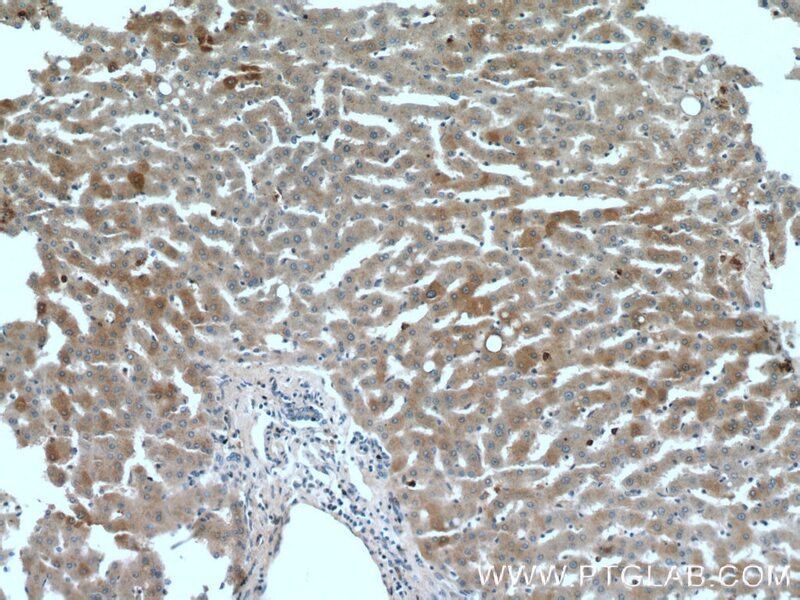 Immunohistochemical analysis of paraffin-embedded human liver tissue slide using 17116-1-AP( OMA1 Antibody) at dilution of 1:200 (under 10x lens). 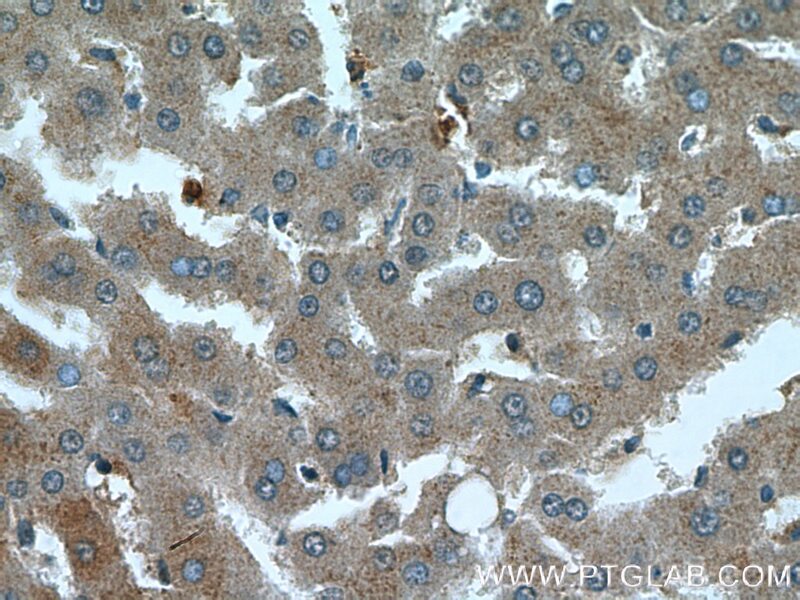 Immunohistochemical analysis of paraffin-embedded human liver tissue slide using 17116-1-AP( OMA1 Antibody) at dilution of 1:200 (under 40x lens). OMA1(Overlapping with the m-AAA protease 1 homolog) is also named as MPRP1(Metalloprotease-related protein 1) and belongs to the peptidase M48 family.It is a zinc metalloprotease that spans the inner mitochondrial membrane with a number of predicted membrane spanning domains and the 60 kDa form of OMA1 rapidly accumulated concomitantly with the cleavage of all OPA1 variants,and the 40 kDa form of OMA1 may be the inactive form, with the 60 kDa form being the active enzyme(PMID:20334834).This antibody is speicific to OMA1. Reciprocal Roles of Tom7 and OMA1 during Mitochondrial Import and Activation of PINK1. Mitochondrial Optic Atrophy (OPA) 1 Processing Is Altered in Response to Neonatal Hypoxic-Ischemic Brain Injury. The Genomic Landscape of Renal Oncocytoma Identifies a Metabolic Barrier to Tumorigenesis. Adult-onset obesity is triggered by impaired mitochondrial gene expression. Laminar Shear Stress Promotes Mitochondrial Homeostasis in Endothelial Cells.